Welcome to the first lesson in the Work with Sensor Network Derived Time Series Data in R module. This module covers how to work with, plot and subset data with date fields in R. It also covers how to plot data using ggplot. In this tutorial, you will look at the date time format - which is important for plotting and working with time series data in R.
Convert a column in a data.frame containing dates and times to a date/time object that can be used in R.
Be able to describe how you can use the data class ‘date’ to create easier to read time series plots in R.
You need R and RStudio to complete this tutorial. Also we recommend that you have an earth-analytics directory set up on your computer with a /data directory within it. 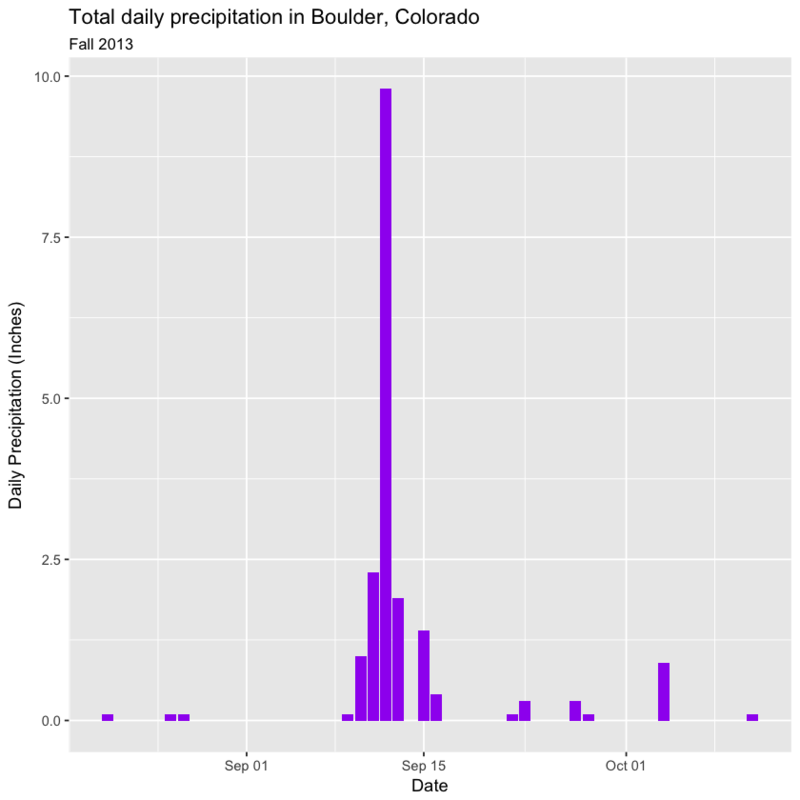 In this tutorial, you will learn how to convert data that contain dates and times into a date / time format in R.
First let’s revisit the boulder_precip data variable that you’ve been working with in this module. # is commented out. If you want to redownload the data, umcomment the line below. Next, plot the data using ggplot(). Notice when you plot the data, the x axis is “messy”. It would be easier to read if you only had ticks on the x axis for dates incrementally - every few weeks. Or once a month even. Let’s look closely at the structure of the data to understand why R is placing so many labels on the x axis. chr - Character: It holds strings that are composed of letters and words. Character class data cannot be interpreted numerically - that is to say you can not perform math on these values even if they contain only numbers. int - Integer: It holds numbers that are whole integers without decimals. Mathematical operations can be performed on integers. num - Numeric: It accepts data that are a wide variety of numeric formats including decimals (floating point values) and integers. Numeric also accept larger numbers than int will. A data.frame column can only store one type. This means that a column cannot store both numbers and strings. If a column contains a list of numbers and one letter, then the entire column will be stored as a chr (character). data to be processed more quickly & efficiently. the program (R) to minimize the storage size. Note that the Date column in your data.frame is of class character (chr). This means that R is reading it as letters and numbers rather than dates that contain a value that is sequential. Thus, when you plot, R tries to plot EVERY date value in your data, on the x-axis. This makes it hard to read. But also it makes it hard to work with the data. For instance - what if you wanted to subset out a particular time period from your data? You can’t do that if the data are stored as characters. 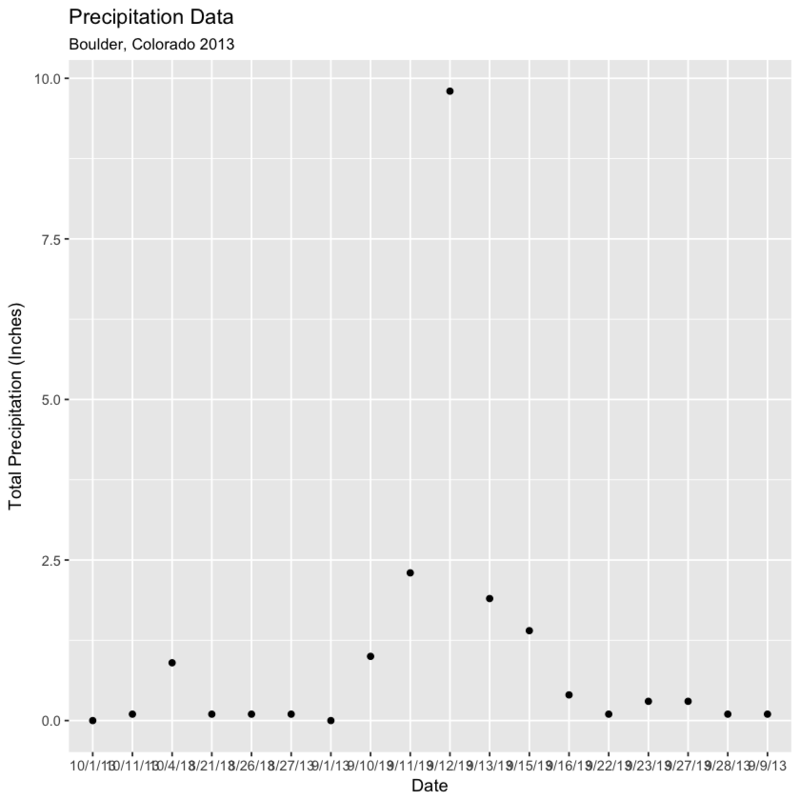 The PRECIP data is numeric so that variable plots just fine. You need to convert your date column, which is currently stored as a character to a date class that can be displayed as a continuous variable. Lucky for us, R has a date class. You can convert the date field to a date class using the function as.Date(). When you convert, you need to tell R how the date is formatted - where it can find the month, day and year and what format each element is in. Your format string will look like this: %m/%d/%y. Notice that you are telling R where to find the year (%y), month (%m) and day (%d). Also notice that you include the dashes that separate each component in each date cell of your data. NOTE: look up ?strptime to see all of the date “elements” that you can use to describe the format of a date string in R.
##  "2013-08-21" "2013-08-26" "2013-08-27" "2013-09-01" "2013-09-09"
Now that you have adjusted the date, let’s plot again. Notice that it plots much quicker now that R recognizes date as a date class. R can aggregate ticks on the x-axis by year instead of trying to plot every day! # quickly plot the data and include a title using main = ""
Now, your plot looks a lot nicer!